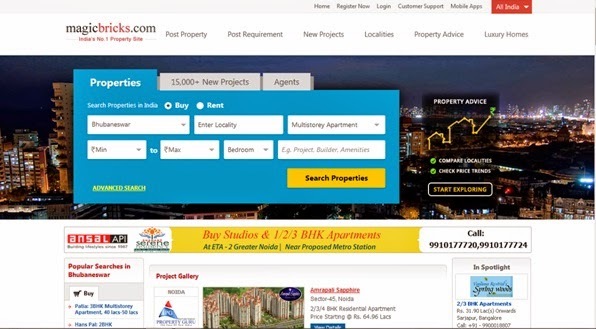 Magicbricks.com is an India's No 1 online property website, located at Noida, India. This site has many options like Post property, Post requirement, New projects, Localities, Property advice, Luxury homes, Customer support, Mobile apps, Property fairs, Real Estate forum, Advertise with us, Signup for alerts, Apply for home loan, Home decor, Property rates & trends, Live help and Feedback. You also find Real Estate in India by major cities like Delhi/ NCR, Mumbai, Chennai, Kolkata, Pune, Bangalore/ Bengaluru, Noida, Gurgaon, Hyderabad, Jaipur, Chandigarh, Coimbatore and Goa. MagicBricks (Real Estate in India) is coming under the TBSL network where other brands are TimesJobs (Jobs in India), SimpleMarry (Matrimonial site), Ad2Book (Classified Print Ads), TCNext (Internet classifieds) and TechGig (Search jobs in IT, software & hardware).